Rumor has it that back bouncing got its start roughly 75 years ago on the Rogue River in Southern Oregon. It’s an extremely effective technique where you slowly bounce your salmon eggs along the bottom and walk it out using the current when fishing out of a boat. Typically, salmon are found along the bottom in deep holes. Back bouncing allows you to target these areas. Not surprising, three-quarters of a century later we’re still using the technique here on the Rogue. There are times where plugs or a diver and bait will produce better than back bouncing, but day in and day out it is the most effective way to fish. When curing eggs for back bouncing there are a few things I’m looking for in the end product. I want an egg that produces a lot of scent over a long period of time. I also need the eggs to be able to withstand heavy current and constantly being bounced off the bottom. Over the last few years I have finally dialed in a cure and the technique to produce the perfect egg that will last a long time, but still produce a lot of scent. As with any egg cure, starting with a high quality product is the most important step. You always want to bleed your fish immediately after being caught. Never let the eggs touch water, and keep them cool until you start to cure them. I prefer to cure my eggs within 24 hours if possible and within 48 hours if circumstances don’t allow me to get to them before that. Before curing you will also want to work out any blood from the vessels along the skein to make sure they are blood free as possible. Pour all the ingredients above into a Ziploc and mix thoroughly. Pour the mixed ingredients back into the Fire Cure bottles for easy application on the eggs. 1. Butterfly the skeins so that they open and expose all of the eggs without puncturing the skein. Depending on the size of the skeins cut them in half or thirds if they are large. 2. Place the eggs skein side up onto paper towels and sprinkle a light layer of cure onto the eggs. Rub the cure into the skein. 3. Flip the eggs over, so that they are berry side up, and sprinkle a fair amount of cure onto them. How much depends on the size of berries and how large the skeins are. 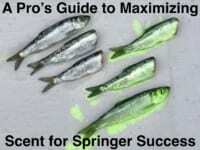 Smaller eggs such as steelhead or springers you want to go a little lighter. If they are large berries such as those found in mature fall kings you’ll want to use a little more cure. 4. Massage the cure into every fold of the skeins, so that every egg has cure on it, and the cure is evenly distributed throughout the entire skein. 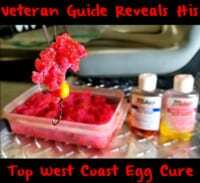 You’ll know you used the right amount of cure if the eggs have all taken on a deep red color and there is little or no powder left. 5. Place the skeins into glass jars for easy long-term storage. The glass jars will allow you to easily mix the eggs during the curing process and will vacuum pack them for storing in the freezer. 6. For the first two hours you’ll want to flip the jars every 15 to 20 minutes. You’ll notice lots of liquid coming out of the eggs. This is exactly what we want. 7. After two hours place the jars into the refrigerator and flip every 6-12 hours. You’ll notice the liquid being reabsorbed. After 24 hours the eggs will be ready to fish, but I prefer to let them cure for 48 hours, if possible. After curing there is no drying necessary. I like to fish these eggs as is and feel that they are perfect right out of the jar. If you’re not going to fish them within a week you’ll want to put them into the freezer to stop the curing process. Once thawed, they’ll last in the fridge for six months and fish as good as the first day. I use this cure throughout king salmon season on the Rogue, which begins in April and ends September 30th. I’ve also had great success with it on coastal tidewater kings. It truly is a perfect all-around back bouncing cure for salmon. Editor’s Note: Steven Theel operates SO Chrome Guide Service in Southern Oregon. For more info on his fall salmon trips please visit http://so-chrome.com.